Almost two years ago I wrote an article for Claims Journal entitled “The Emerging Hail Risk: What the Hail is Going on?” The response was overwhelming. It was Claims Journal‘s most read article for several weeks and the second most read article for the entire year. The property insurance industry is under attack. The present battle has nothing to do with repairing roofs actually damaged by hail, but instead putting money in the pockets of individuals who can find a way to inject themselves into the insurance claims process. I called out these individuals as “contractors, public adjusters, policyholder attorneys, and other assorted crooks and frauds.” The label was strong. It was the first time someone “from the industry” spoke about the issue in such candid terms. Where this leads is now crystal clear. The hail risk has emerged. The attack continues. And there is no balance. The scales are tipped far in favor of the assorted crooks and frauds. As a result, what the hail is going on right now is nothing less than an all-out feeding frenzy to sign up building owners and file lawsuits against insurance companies. Sadly, there is no end in sight. Earlier this month, two significant hail events struck neighborhoods in North Texas. These neighborhoods are today littered with yard signs and door hangers, not only from roofing contractors and public adjusters, but incredibly also from attorneys. After other recent storms across Texas, attorneys set up folding tables and banners in front of grocery stores and at weekend flea markets. Yes, Texans can now buy Girl Scout cookies and hire a lawyer in a single stop. Really? Is this the new insurance claims reporting model in Texas? So much for reporting a claim to your neighborhood insurance agent. Just call your lawyer! This is only one aspect of the all-out assault. Perform a simple Google search using the words “hail insurance claim Texas”. The first three hits are all paid advertisements. One for a roofing contractor. One for a public adjuster. One for an attorney. Yes, a lawyer ad appears even though the search doesn’t include the word “lawsuit”. So much for the homeowner working cooperatively with the insurance adjuster in amicably resolving a claim before thinking about a lawsuit. 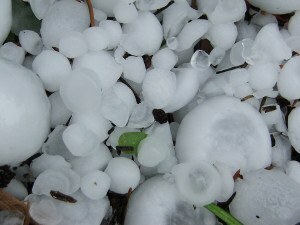 Today, hail damage insurance claims are no longer about getting a roof fixed. Lawyers market a mindset that an insurance claim can be a profit center, both for the building owner and the lawyer. Fortunately, many Texans still submit their own insurance claims and work cooperatively with their insurance companies. Historically, the Texas insurance industry reportedly has a 98 percent success rate in resolving claims without litigation. That’s pretty impressive. And that high rate of success in amicably resolving claims remains the case today. But only until the doorbell knockers arrive long after the storm and long after repairs are completed. Canvasser: Hello, I’m here to get you a free roof after the recent hailstorm. Homeowner: No, thanks. My insurance company bought my roof. Canvasser: But did they pay for your fence? Homeowner: My fence? My fence is fine. Canvasser: No its not. The hail broke the water seal. Wood rot is certain. Homeowner: That’s ok. My insurance company treated me fairly. Canvasser: No they didn’t. They should have paid you 20 percent extra for general contractor overhead and profit. Homeowner: But I didn’t have a general contractor. Canvasser: Doesn’t matter. They owe it. Here, sign this form and I will make certain you get additional money from your insurance company. And the best thing is that you can do whatever you want with the money. Need a new car? Swimming pool? Caribbean vacation? The insurance companies always pay. There’s no downside. Homeowner: Wow! I need a vacation. Where do I sign? Canvasser: Here is our contract. Sign here. Oh, and by the way, sign these two pieces of paper also just in case we need to bring in a public adjuster and lawyer to help you. Canvasser: We’ll send someone out to inspect your house and write up an estimate for damage. Really, you ask? Does this actually happen? Yes, it does. Hundreds of times a day all across Texas. In fact, it is typically the case that a supplemental claim is never even submitted. The insurance company hears nothing – absolutely nothing – about a supplemental claim until….. Allow us to introduce ourselves. We are your lawyers! Nice to meet you. We filed a lawsuit today on your behalf against your insurance company. We will let you know when it goes to mediation. Don’t worry. You don’t even have to attend mediation. We will settle the matter for what we think is fair and send you a check for your portion. I know what you are thinking. This sounds like criminal barratry. I suspect you are also thinking this must violate multiple ethical rules. Unthwarted, however, by any concerns about barratry laws, ethical standards, or even just good common sense, the lawyer pursues the lawsuit on behalf of a client it has never met (some homeowners don’t even know they are parties to lawsuits). Eventually, the lawyer settles the lawsuit – without the homeowner ever being consulted as to amount of damage being alleged, without attending the mediation, and without being asked about an acceptable settlement amount. The homeowner then receives a check, usually for less than half the settlement amount after the lawyer, “public adjuster”, “estimator”, and “expert” are all paid (yes, the quotes are appropriate as none of these players are truly filling these roles….more on that later). There is no denying that this model exists all across Texas. Don’t believe me? Send me an email. I’ll send you the documents to prove it. Are you convinced now that the words “all out feeding frenzy” are appropriate? Since my article appeared two years ago, nothing has changed. In fact, let’s be honest. It has gotten worse. No longer do we have a problem only in a single impoverished county in South Texas (where over 11,000 lawsuits were filed after a single catastrophic event). We now have a problem all across Texas (where nearly 10,000 hail damage lawsuits are being filed each year). Every day, I receive listings of all the new lawsuits filed in Texas. The reports for numerous Texas counties – Potter, Dallas, Tarrant, Webb, Cameron, Hidalgo – are chock-full of hail lawsuit filings every single day. Sometimes a single lawyer files a half dozen lawsuits or more in just one day, with the pattern repeating itself several times a week by the same lawyer filing lawsuits in several different counties. I often wonder how that lawyer has time to travel around the state to meet with and sign up all of those clients himself, to draft all of those petitions and then to litigate all of those lawsuits. The answer is simple. He doesn’t. Want proof? Go to a resume posting website like indeed.com. Type in the name of a lawyer who you know handles hundreds of hail lawsuits. You will find resumes from numerous past employees of that lawyer who describe their previous job functions as “drafting pleadings”, “speaking to homeowners”, “negotiating with adjusters”, “answering discovery” and “resolving insurance claims”. None of these people are lawyers. Most aren’t even paralegals. How is this not the unauthorized practice of law by these individuals? How is the lawyer who allows his name to be put on all of these pleadings not violating any ethical rules? Of course, the problem is not just the lawyers. There are also roofing contractors who continue to act as “insurance claim specialists” and offer to “negotiate on your behalf” despite clear laws prohibiting such conduct. These contractors also continue to waive deductibles, which is illegal. But the contractor problem goes far beyond just roofing contractors. The “insurance restoration contractor” industry is growing more aggressive in their tactics. Each month they hold seminars and conferences on how to “win the storm” and “get overhead and profit on every claim”. Speaking of which, have you noticed that most roofing contractors are now calling themselves general contractors? Apparently they are being taught that this title will help them get overhead and profit on every claim. These contractors also have online forums where they exchange ideas on how to inflate Xactimate estimates. Here is another interesting twist. The lucrative nature of the insurance restoration contracting business has resulted in public adjusters turning in their licenses to become contractors. Why? Because a public insurance adjuster is limited by statute to a 10 percent commission. A contractor that can get away with negotiating insurance claims has no limits on what it can earn. This “paper contractor” (called such because they are really just sales people) will submit an inflated Xactimate estimate, get the carrier to pay, and then subcontract all of the work out for 50-60 percent of the insurance proceeds received. That’s a 40 percent profit margin. Far, far more than the 10 percent commission earned by a public insurance adjuster. These same contractors also want a piece of the litigation action. To accomplish this, they ask former employees to create public adjusting and estimating companies. Eventually the money paid to these companies gets back to the contractor. This nets the contractor 10 percent of the litigation settlement, disguised as a “Public Adjuster Commission”, and a $1,000 referral payment from the lawyer, disguised as an “Estimator Fee”. All of this comes out of the homeowner’s insurance settlement. The bad actors have also circled their wagons around the appraisal process. There now exists an entirely new industry of professional appraisers who advertise as “appraisal advocates for the insured” and boast of their “95 percent success rate”. That’s curious, given that appraisal was intended to be a quasi-judicial dispute resolution process with appraisers acting as unbiased neutrals in search of the fair and correct result. Not any longer. The professional appraiser is an advocate for the policyholder and knows how to turn a legitimate $1 million dispute as to the cost to replace a large roof into a $5 million dispute with new allegations of damage to bricks, windows, and other additional damage components not previously part of the claim. The umpire then issues a “compromise” appraisal award for $1 million. Some compromise, huh? The law of large numbers prevails. These are just a few of the schemes being pursued by the traditional players in the insurance claims process. New business models and claim schemes are emerging all the time. One new business model is the self-anointed title of “Claim Consultant”. Apparently, these people are not lawyers and they are not public adjusters. They call themselves “claim consultants” who bring all the necessary players (contractor, estimator, meteorologist, lawyer, etc.) together for the benefit of the building owner. And for this service they take 20 percent of the paid claim. This can’t be legal. It has to be either the unauthorized practice of public adjusting or the unauthorized practice of law. Perhaps both. The latest claims scheme in Texas, one that was imported from Florida, is the “falling object” claim. Do you have a single broken Saltillo tile in your pantry from a falling can of green beans? No worries. A public adjuster, his appraiser friend, and his lawyer buddy will all team up to argue that the insurance company should pay for a new floor throughout your entire house. This is because the tiles are 20 years old and the one cracked tile cannot be “matched” with all the others. Thus, they argue, the insurance company should pay for an entire new floor. The public adjuster knows what the insurance carrier will do when faced with the choice of paying a $10,000 nuisance value settlement or spending $100,000 to litigate through trial. Settle. And if 50 homeowners can all be signed up with one of these claims, that’s a nice chunk of change. I could go on with more examples. But I think you get the point. In the end, nothing has changed in Texas. In fact, the ongoing crisis is getting worse. Given the recent significant hail events in North Texas, with over $500 million in estimated property damage from these storms alone (and we are only in early April! ), there is no doubt that the all-out feeding frenzy will continue – so long as the legislature allows it. Not surprisingly, the hail lawsuit crisis has gone national. Colorado, Oklahoma, Mississippi, Minnesota, Arizona, and anywhere else where hail falls from the sky and damages property. Texas lawyers are running ads across the country. You don’t believe me? Google the phrase “hail damage lawyer” and any state name. Most of the ads and top hits are from Texas law firms prepared to work in any state. And then there is Florida. Talk about a mess. Incredibly, in Florida a contractor can ask the homeowner for an assignment of benefits. Yes, the contractor actually pursues the claim and initiates litigation. How is that not a conflict of interest? Sadly, one small regional carrier advises that 30 percent of all new claims are reported by lawyers. Fortunately, assignments of benefits are not allowed in Texas and most other states. Like mold and similar previous attacks on the industry, in the end the insurance companies will respond by limiting or even excluding coverage. That effort is already underway. While that will provide the necessary and inevitable end to the battle, the unfortunate loser in all of this is the building owner who truly had holes knocked in his roof by large hail. Because of all the money being paid today to contractors, public adjusters, policyholder attorneys, and other assorted crooks and frauds, the guy with water pouring through large holes in his roof caused by large hail will no longer have coverage. And that is truly unfortunate but inevitable absent legislative change. In 2015, the Texas legislature had an opportunity to provide such legislative change. It failed to act. As a result, the insurance industry is responding. Policy forms are being amended to clarify and at times restrict coverage. Deductibles are increasing. Insurance companies are turning to actual cash value only policies. Most troubling is that some companies have completely withdrawn from certain markets. At least two major insurance companies have stopped writing policies in South Texas. As a result, as predicted, there are Texas homeowners struggling to obtain insurance for their homes. Again, you don’t believe me? Call an insurance agent in Hidalgo County and ask what has happened to rates and availability of coverage in the past couple years. No one disputes that insurance companies should promptly and fully pay to repair building components damaged by hail consistent with the terms of their policies. Insureds should be brought back to their pre-loss condition with materials of like kind and quality. That is a given. And when insurance companies knowingly fail to meet these fundamental obligations, they should face penalties. I agree with that. Conversely, insurance companies are not charitable organizations. They should only be obligated to pay claims consistent with the terms of their policies. They should not be asked to pay for roofs simply because they are old. They should not be asked to pay for damage that occurred long before their policies incepted. They should not fund vacations or new cars by paying for building components, like fences and bricks, that are not damaged and that the insured had no intention of ever replacing. And, most critically, they should not be forced into the untenable position of settling meritless lawsuits – lawsuits often filed without their insureds even knowing they are plaintiffs – simply to avoid the cost of litigation. In the end, Chip Merlin is right. We need to strike the right balance. When hail lawsuit reform legislation was proposed during the 2015 Texas legislative session, opponents argued that it would “gut the insurance code” and “take away the homeowner’s rights to sue when insurance companies act badly.” Neither assertion was accurate. Each of the nine specific legislative changes set forth in the proposed legislation were directed at ending a particular abuse common in the hail claims and litigation process, while preserving the consumer’s right to sue when bad insurer conduct actually occurred. But that all got lost in the political scare tactics. Trial lawyer groups argued that all the problems were the result of bad public insurance adjusters and a very small number of corrupt attorneys. They proposed a simple solution – further regulate public insurance adjusters and enforce barratry laws. That proposed solution was shallow and self-serving. Legislation was enacted in 2015 that now precludes public adjusters from accepting or paying referral fees and prohibits public adjusters from signing up clients solely for purposes of flipping them to an attorney. While the new legislation ended both of these specific practices, the overall crisis is much larger and far far from over. Further, while barratry laws have been on the books for decades, barratry remains commonplace in hail claims and other areas. There is no information indicating that a single lawyer has been disciplined for barratry in a hail claim. Not one. This is despite the fact that everyone on both sides of the docket knows darn well that it is going on. So just saying “enforce the barratry laws” is no solution at all. More must be done to strike the right balance. The Texas legislature has another opportunity to strike that balance in the approaching 2017 legislative session. The insurance industry must receive relief from the abuses it is facing in the claims process and the thousands of lawsuits being filed across the state. Conversely, any such relief must ensure that building owners have adequate remedies when insurers knowingly engage in improper conduct. Most of the abuses, fraud and other illegal conduct fueling the Texas hail claims crisis can be remedied with legislative action. Balance can be restored – a balance that provides the insurance company with protection from improper conduct and likewise provides the building owner with protection from improper conduct. Otherwise, if nothing is done, the Texas hail claims feeding frenzy will continue unchecked. In two years from now I’ll write another follow-up article talking about how additional insurance companies have stopped writing hail policies in Texas. As a result, there will be Texas families with real hail damage to the roofs on their homes and no insurance coverage to fix it. And as I said in 2014, that is truly unfortunate but inevitable absent legislative change. Today, we are two years closer to that inevitable result.